The collection of timber furniture and joinery pieces created for Port Officers House use sustainable local timbers to purposefully connect the arts with contemporary timber detailing and manufacturing. 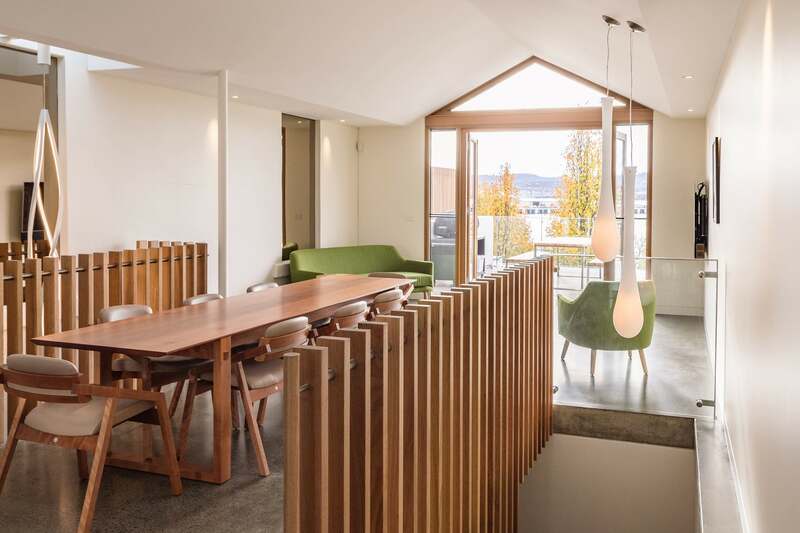 Architect and furniture designer join forces to pay tribute to the owners Robert and Ruth, who have a deep love of Tasmanian timber and support for local designers. 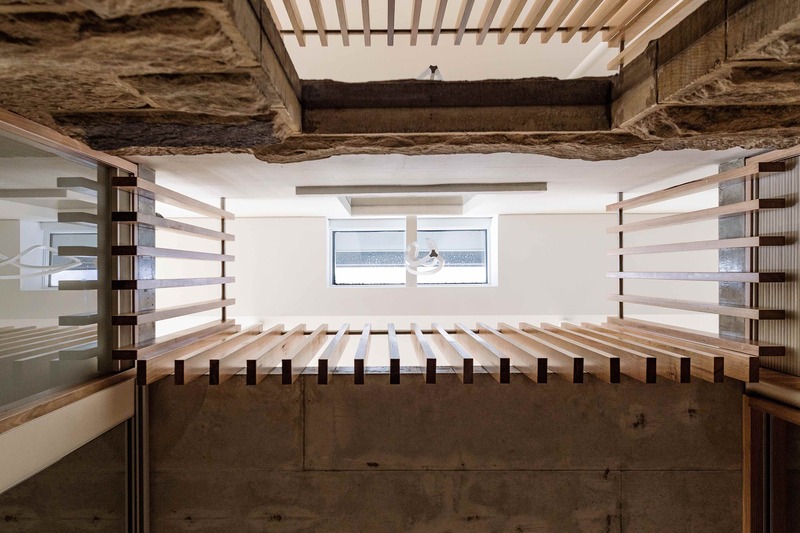 Dunsmuir and Birrelli have used cutting-edge CAD and timber technologies at Port Officers House, purposefully connecting the arts with contemporary timber detailing and manufacturing. 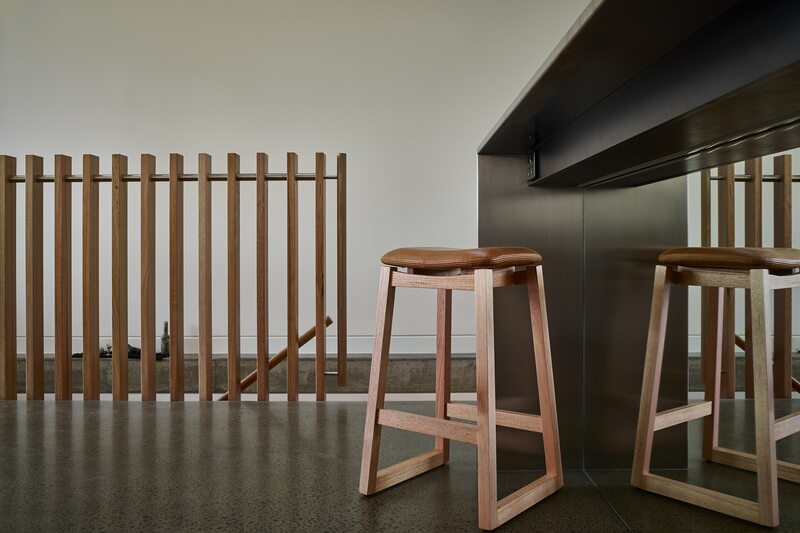 The timbers used in the architecture and furniture at Port Officers House shift away from the anonymity of consumers goods, providing meaningful connections with finished timber objects – tables, chairs, beds, stairs, and joinery – to create ‘conversations’ not just ‘convenience’. The convenience of ready-made products and furniture too often lacks design integrity and objects quickly churn from consumption into waste as landfill. The timber furniture and joinery of Port Officers House leads by example, providing timber lovers cost-effective, good quality furniture and joinery to individualise their lifestyles and spaces. 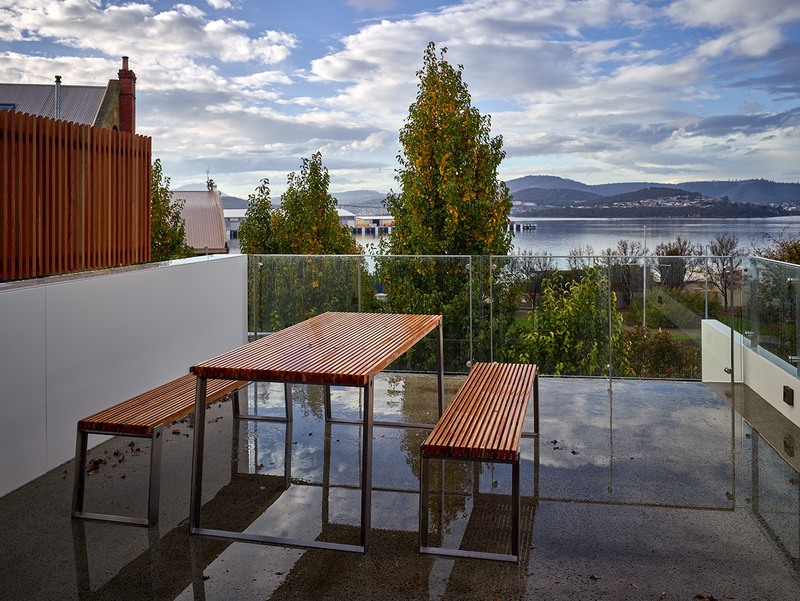 The architectural joinery features solid and veneered Tasmanian oak to ensure an endemic authenticity to the bespoke interiors of Port Officers House on Salamanca Place, Hobart. Tasmanian oak was chosen for its durability, unique visual quality, a sustainable local timber. Timber was chosen as an essential materia to specifically contrast against raw concrete floors and ceilings. Tasmanian oak hues imbue the building with a friendly, inviting, and measured tectonic expression. Stairs, handrails and fenestrations, full height internal and external doors are precision finished in solid Tasmanian oak. The stable solid internal timber doors bifold to allow an underground convict wall turn into a guest room and study. The tactile and warm visual qualities make a luxurious house, a dream home. 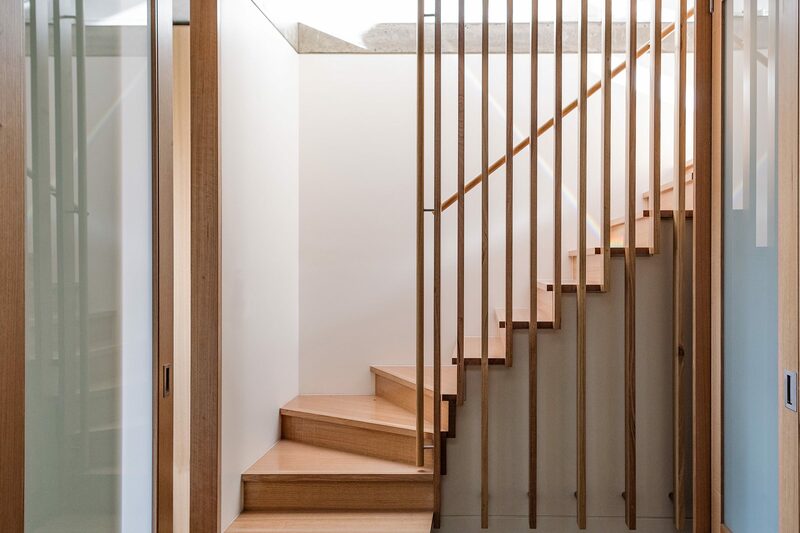 Like the touch and feel of putting on a favourite coat, the natural Tasmanian timbers are placed on elements within the house that you come close to and touch, like handrails and doors. The detailing is exceptional. 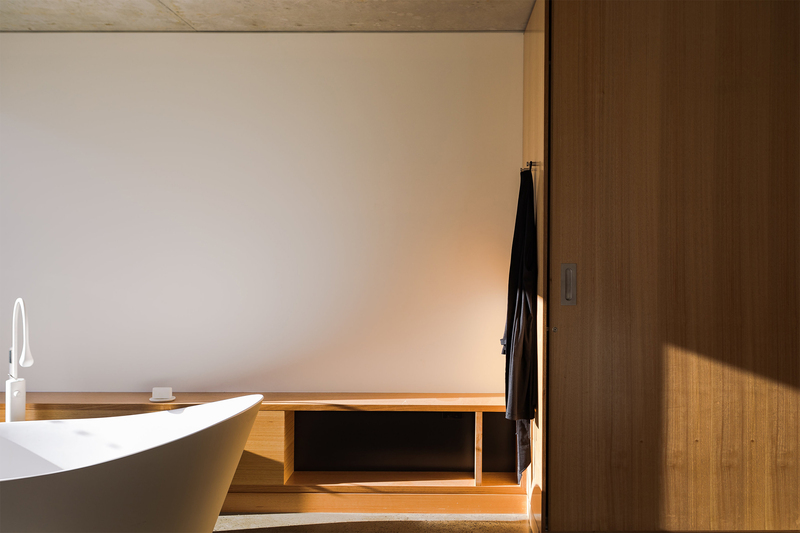 Full height Tasmanian oak veneered cupboards turn into a low storage units and shelf – set beside a freestanding bath, big enough for two, perfect for bubbles and a view into the Japanese courtyard. Joinery acts as furniture for displaying sculptures and storing books. 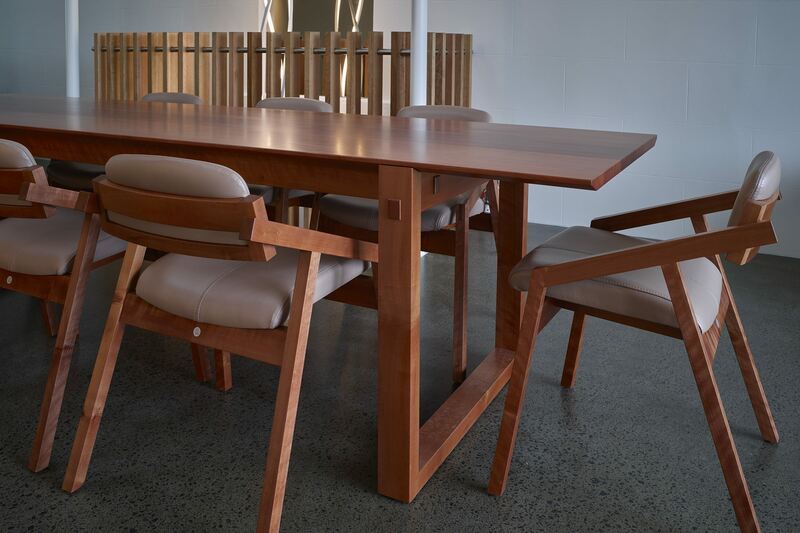 The tables designed for Port Officers House celebrate the clients deep connection to Tasmania through the use of special timbers they collected over twenty years. The dining suite combines the acclaimed XO chair with a bespoke table crafted from some of the last pink myrtle harvested from the pipe line corridor in Tasmania’s South West. Long and slender in form the table responds to site, providing for a variety of entertaining options while celebrating the material, scale and timelessness unique to this Tasmanian timber. The outdoor setting utilises a minimum of materials, devoid of finish which in time will mellow to shades of silver. The stainless steel structure supports slats machined from celery top pine, timber which the client has stored since the late 1990s. The mis-matched boards were ripped through 90 degrees leaving the internal faces textured with the original saw millers marks while providing for a flat uniform surface, leaving a lasting reminder to the origins of the timber. Tables are made to the same width and height allowing the client to bring them together inside to create comfortable dining for up to eighteen guests. Dining table and XO chairs, finished in mirothane satin clear. 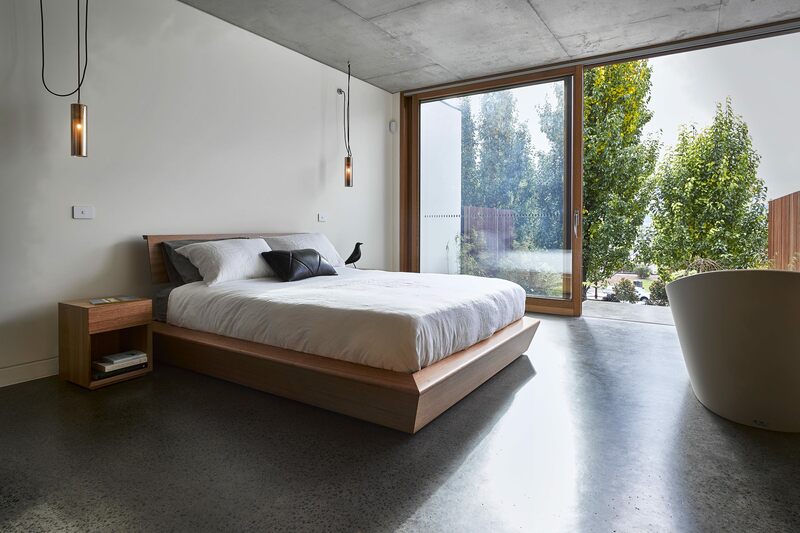 The bespoke bedroom furniture found in Port Officers House is the result of a carefully considered material pallet while elevating a much underrated Tasmanian timber – one often selected for utility over beauty. 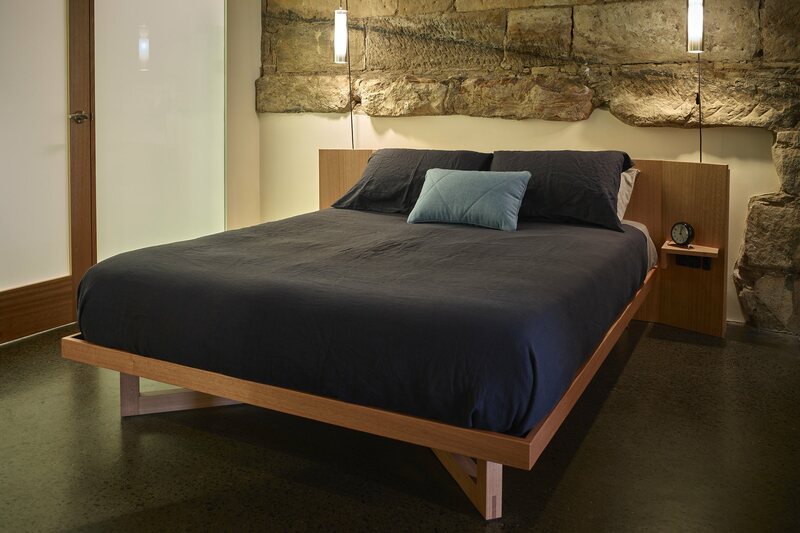 The inherent beauty and strength found in Tasmanian oak lends itself perfectly to the design and crafting of contemporary furniture, that responds to place and connects with the existing 1840s heritage sandstone wall. The master bed suite emphases the stability and strength of Tasmanian oak expressed through a heavily tapered pedestal base and finely detailed mitred drawers. A balance of rigid geometry with a softening of detail and profile resonates with the qualities of the built environment. 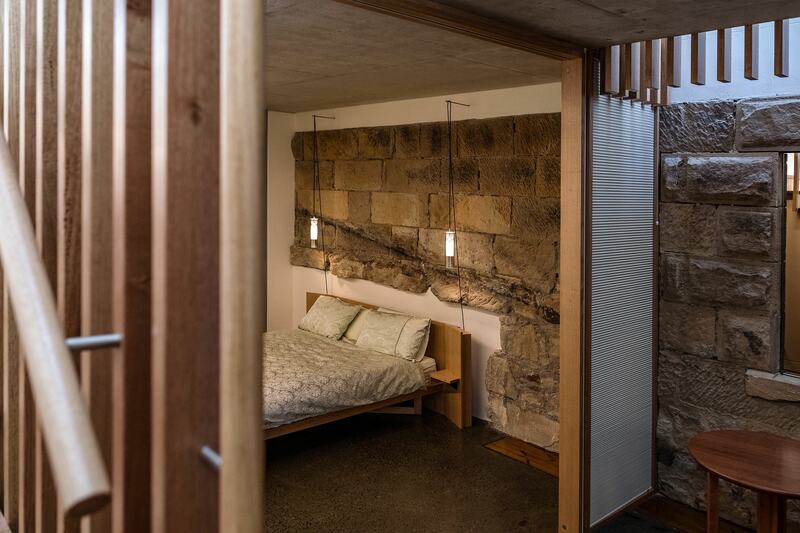 The guest room furniture addresses a number of key practical considerations in respect to the site’s existing sandstone wall. The bed head sits gently off the stone wall, giving separation while at the same time providing a sense of enclosure and comfort with the introduction of the gentle folds. It also provides a platform for light switches and a small night shelf for a phone or glasses. All of the bedroom furniture is made from solid timber and veneered panels in Tasmanian oak and finished with mirothane satin clear.